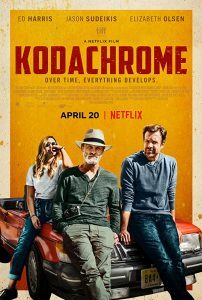 Plot: The film is based on A.G. Sulzberger’s 2010 New York Times article “For Kodachrome Fans, Road Ends at Photo Lab in Kansas” about a father and son who take a road trip to Kansas in order to develop photographs at Kodak’s last Kodachrome lab before it closes its doors forever. Print article This entry was posted by jojotree on December 4, 2018 at 1:54 pm, and is filed under Drama. Follow any responses to this post through RSS 2.0. You can leave a response or trackback from your own site.